David and Susan Siegel embarked on a long, long journey many years ago, so long it may more accurately be described as a trek. To date it has exceeded 100,000 miles in length and 10 years in duration, and it hasn't ended yet. Let's hope that it doesn't end anytime soon because along the way they've produced a series of guides to used bookstores across the United States and Canada that have significant value for booksellers, collectors and readers alike. 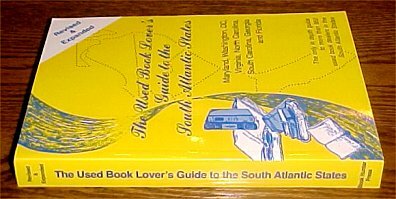 "The Used Book Lover's Guides" are published in seven regional editions, covering six areas of the United States and Canada. Each regional guide lists 100's and 100's of used bookstores and provides some or all of the following information on each: a brief description of the nature of the collection, size of inventory, specialties (if applicable), hours of operation, directions, types of payment accepted, owners' names, year established, and general (sometimes pointed) comments pertaining to prices, condition and makeup of the collection, with occasional asides. "A most impressive shop and a treat to visit. We have no doubt that the shop's claim to being Florida's largest book store is accurate. While the owner readily admits that the shop is not a 'rare' book store, the shop certainly has a very fine selection of used and out-of-print titles (about 30% of the shop's total stock) ranging from turn of the century titles to far more recent volumes. The huge shop (which could easily accommodate half a dozen typical used book shops) is extremely well organized with wide aisles and the new and used book shelves clearly identified by colored labels. We spotted several uncommon titles and suggest that unless you're an absolute purist in the world of antiquarian books, you should enjoy spending some time visiting here. We found the books to be very modestly priced." We can confirm that these comments are spot on, but at the same time this illustrates what this guide isn't, wasn't intended to be, and in fact couldn't possibly be - a guide to bookstores where you're most likely to locate inventory for online resale. For example, despite moderate prices at Haslam's, our purchases (for resale) there have been few indeed, and yet the Siegels highly recommend it - but it should be recommended because there are many good reasons to visit bookstores other than attempting to locate inventory. However, there's good news for booksellers too. These guides can be mined for clues that may lead you to locating productive stores and not wasting time in unproductive ones. For example, the fact that a store such as Haslam's contains 300,000 plus volumes indicates that, if you're on a road trip, the effort required to pay them a visit might net at least a few things of interest, if not more, by sheer numbers of books alone. Another factor that may be important: year established. In Haslam's case it's - whoa - 1933. This suggests that they have successfully avoided the brief, bright-to-dark life cycle we discussed earlier for an astounding 70 years. Unfortunately, this also suggests that the staff possess an extensive knowledge of books (and their values), and it's unlikely that any sleepers are dozing on their shelves - not the best of news for the bookseller hunting for inventory. Had the year been, say, 1997, this might have been a red flag for reasons cited in our previous article. Information we wish was included but isn't: online presence. Knowing in advance that a shop does or doesn't sell online might be very useful to a bookseller in making a decision to visit or not. Here's our vote for adding it to the next survey! The majority of dealers listed operate open shops, but listings also include appointment-only dealers, mail-order-only dealers, and dealers who occupy space in antique malls. Not all existing bookstores are listed, but many are - in fact, in the metropolitan area we live in, well over 90% of our local stores are listed. Susan Siegel is careful to point out that the target audience includes book buyers of every description, and the corresponding makeup of included shops reflects this, ranging from lofty, antiquarian dealers to paperback exchanges. The guides are arranged geographically, by state, to facilitate their potential use on road trips. 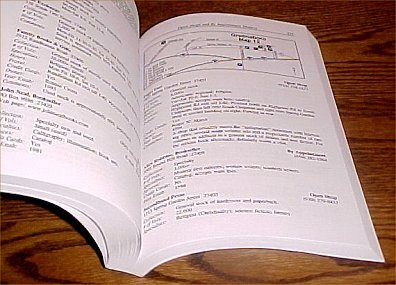 State, regional and city maps are included. The city maps are keyed to stores and quite helpful in scheduling an itinerary. A question that may come to mind is, are these guides up to date? Used bookstores don't come and go with the frequency of restaurants, but they aren't far behind, and the publication date in our guide is 1998. The Siegels address this problem on several fronts. New guides are published every few years, as are annual supplements which list both new and closed bookstores. When a guide is ordered, all applicable supplementary material is shipped with it, ensuring that the material is at the very most a year old. Subsequent annual supplements may be purchased for $3. Better yet, an online version is also available, which is updated more frequently. Searches based any of a number of parameters, including proximity to Interstates (great for road trips) and dealer specialties, return instant and useful results. At present there is no capability to search areas based on miles from a central point - for example, all stores within a 100-mile radius of St. Petersburg, Florida - but if one could be added, it would be most useful. The Siegels, who can't be everywhere at all times, necessarily rely, to some extent, on user input. They welcome suggestions for new bookstores and appreciate information relating to store changes and closings. After informing Susan Siegel of the recent closing of a local bookstore in our area, we were pleasantly surprised that she was already aware of the closing and in fact knew more than we did - namely, that the business hadn't closed at all but had relocated. This speaks well to the timeliness and quality of their information. Prices for individual guides range from $14.95 to $19.95 and may be purchased either new or used on BookThink's BookShelf or on their website at Book Hunter Press . Regional online 24-month subscriptions are available for $20 each. Deep discounts are offered for multiple purchases of either print or online versions. Some of our readers may recall the Siegels' report "The Quiet Revolution: The Expansion of the Used Book Market." Updated figures are scheduled to appear in the next IOBA Standard. Siegel reports that "we're also in the process of finishing a much more detailed survey of the used book market that should generate some new statistics on online vs. brick-and-mortar sales. The results of the survey should be available in the first quarter of 2004." Included in this will be an analysis of percentage sales derived from different venues, total sales, and net profit and trends.